The Faaker See Festival is the biggest motorcycle rally in Europe. It takes place in Austria, at the Faak am See village, next to Villach and close to the North Eastern Italian border. Hundreds of thousands of bikers gather here yearly at the beginning of September, most of them usually coming from all around Europe and even outside of it, just like you, Besides the large number of participants, what make the event special is that it is the biggest continental Harley Davidson meeting! So, be prepared to get an overdose of Milwaukee’s Big Twins, chrome, great bike shows and, a huge amount of fun! This tour has been designed to give you the privilege to attend this unique event, and ride an Harley through panoramic roads and stunning landscapes. We’ll cross the Apennine’s range twice, starting from Firenze to Bologna and, on the way back, from Abano Terme to Firenze. Moreover, leaving from Belluno and heading on to Kranjska Gora (Slovenia, a city laid on a beautiful valley, a few kms from Faak am See, the venue of our event), we will be riding thru the geologically unique Dolomite range, an ancient mountain formation that dates back to approximately 280 million years ago. In between, we’ll pass through the tragic Vajont’s dam (…on November 1963 a giant landslide fell into the dam’s basin, causing a mountain’s Tsunami and killing over 2.000 people). We’ll have a lot of Alpine roads, some quiet countryside environments and, a few busy towns to get through which will give you the vibes of what it is to ride a bike in the Italian ‘traffic’. Lastly, you’ll be able to give some extra gas too, when riding on the fast Italian Highways. However, not only riding has been included with this tour, for, we will be spending our time in Firenze (the birthplace of The Renaissance), admiring its architectural and figurative masterpieces, or having a shopping leisure in the old city. On top of it all, we’ll always recommend you to follow our few basic suggestions on how to manage the tour and its timetable, in such a way that you will enjoy the tour at its best. So, having said that, …..dear Gentlemen start your engines, it’s time to ride to The Faaker See Festival! We have a choice from most recent models of BMW, HARLEY DAVIDSON, DUCATI and many more. Pick up service upon arrival at the international airport. Twin sharing room accommodation in hotel. Farewell dinner last night before departure. English speaking guide(s) / (other languages possible). Each motorcycle will come with basic side bags and, with the exception of a few models, also a back bag or box. Cost of fuel, lunch & dinner and personal expenses. Highways [charges for all toll roads used during the tour]. Travel/medical insurance [we recommend that rider(s) subscribe for an own travel insurance in the country of origin]. Extra cost for a single hotel room. Motorcycle gear and helmets. However, if riders need, both motorcycle gear and helmets rental are available at a price varying from € 15/day. GPS Navigator rental estimated at € 10 to € 20/day. We recommend that rider(s) brings his/her own extra motorcycle bag or tank bag along with him/her. At the moment of booking we will request a 30% down payment by bank to bank money transfer as a guarantee: ‘Yes, I want to ride this tour / deposit*’. Full payment must be made (bank to bank money transfer) not later than 5 weeks before the starting of the tour. Cancellation made after the 30% down payment (deposit*) and re- quested before 5 weeks from the starting day of this tour will be held with us until rider/client is available to come ride this guided tour in the following season. We decline any deposit* and obviously full payment restitution in case of cancellation made within 5 weeks from the starting day of this tour. Upon accepting the rental agreement and, depending on the motorcycle chosen, we will request a refundable deposit varying from € 2.000, to € 2.500, to be secured for exclusively by credit card (Visa/MasterCard). Rider(s) must be 21 years or older and must be holder of an International Driving Licence. Rider(s) is recommended to have his/her own Travel/Medical insurance. This package is tailored for 10 days – 9 nights and a minimum of 10 motorcycles per tour. Other options are all the time possible. Please feel free to request according to your needs. Participants’ arrival at Bologna/Firenze Airport / Italy. Pick up and Transfer to the Hotel / Check in / Welcome and refreshments at the Hotel. Time to relax and deal with the jetlag. Do not underestimate the 5-6hrs time difference between your country and Europe, which might unexpectedly affect your mind and body for 1-2 days So, the first day it’s RELAX DAY, and we will dedicate it only to our Tour presentation & Briefing. After this, everyone is free to take his/her own time to lay back, hang around, do shopping, dine, etc… Have a good night rest /. Good morning! After an early Breakfast we’ll go pick up the motorcycles, We’ll gather for a pre-ride briefing. We’ll leave Firenze heading to Bologna. We’ll ride across the Apennine’s roads for about 100kms. A green and at times rocky environment will accompany us throughout this first part of the tour. Once in Bologna we’ll take our first coffee break. Ready to share our first impression on the bikes and the sceneries we just left behind, we’ll stop for a little while. It’s time to get back on our bikes and, by taking advantage of the Autostrada [Toll highway] we’ll skip the crowdy roads of the Padania plane, heading straight on to Mestre [our tour day destination]. Mestre, which is the city just on the edge of the Venetian Laguna, is perhaps less attractive than Venice but definitely less crowded and more convenient to park our bikes safely for the night. We’ll arrive at destination in the late afternoon, after the due hotel check in we’ll take time to relax and then go enjoy some dinner all together. PS: Who wants to attempt venturing into Venezia the same night may do so. There is a train connecting Mestre to Venezia [time schedule to be checked though] and also a regular taxi service to/from. …The day is coming to an end. Good night! [PS: Although Mestre is usually our base to explore Venezia, in order to give our guests a better and more comfortable accommodation, we may find our hotel in the surrounding area]. the turn of a few centuries it became one of the most powerful, influential and economically rich city in Europe and perhaps in the whole world of that time. (Marco Polo, notorious traveler, ambassador and merchant of the late middle ages was a Venetian and it was from here that he first departed when he went on his mission to discover the Far East… the rest is mere history. Walking thru the small alleys and subtly breathing the odors & perfumes of this city will give you an intense and emotional feeling. Its atmosphere, will make you feel like being suspended between dreams and reality…..). PS: Because of its particular position, it’s quite hard, if not almost impossible, to get there with vehicles, due to busy traffic and a perpetual lack of parking lots. So, in order to avoid trouble and delays, we’ll use a short train ride to Santa Lucia Station, from where our visit will begin. We’ll take a walk thru narrow alleys, small bridges and picturesque buildings and houses, all of which was built upon water. Crossing Cannareggio neighbor, we’ll reach Canal Grande and Rialto Bridge, one of the top icons of the city. Few hundred meters further and we get into Piazza San Marco. It’s pretty useless to try and describe this place: you must get there to realize how stunning it is. We’ll take a quick look at Basilica di San Marco and Ponte dei Sospiri, prior to getting loosen from the group and continue our exploration independently. The city is large and at times ambiguous but it won’t eat nor overwhelm you with its mysterious atmosphere So, go further into it and enjoy it. We’ll gather later on at meeting point X to get back to our hotel, pick up the bikes and ride on. We’ll reach Treviso and the Valdobbiadene and finally arrive in Belluno. Leaving Belluno, our roads are leading up to the Vajont’s dam and, from there, riding just in between rocky mountains we’ll take a glimpse of the emerald green river waters of the Lake Barcis. The scenery is very stunning, the road beautiful, and the riding experience is at its top. We’ll pass through Maniago, Osoppo and Pontebba and then on to Tarvisio, and the Slovenian border, where we’ll finally reach our day destination in the small but very welcoming city of Kranjska Gora. We’ll have the whole day to spend on our own, to ‘explore’ the environment and feel the mood of this very special event. 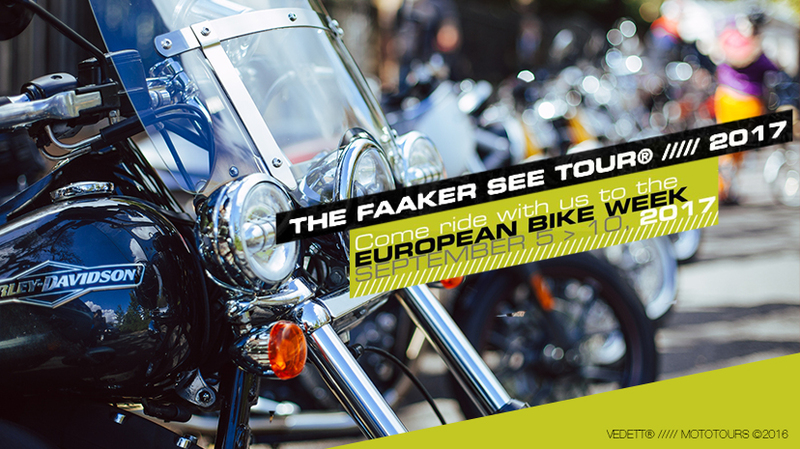 There will be thousands of bikes [and bikers of course] coming from all over Europe, bars to seat at and drinks to enjoy, shops with vendors to stroll around, gadgets and all sort of rare paraphernalia to buy, bikes shows and,…..a huge community to share the same passion with. Sunday morning, it’s time to head back. We’ll leave the venue of the Faaker See, on an early time, riding back to Italy. After crossing the Austrian/Italian border we’ll hit a secondary road, which will lead us up on to the Sella Nevea Pass, at 1.190 mt. of altitude, bouncing at the Slovenian border for a while. Still riding on quiet and silent roads, curling up curves and sceneries, we’ll reach the Tagliamento River Valley and at this point, in order to save time and rid us from stress and unnecessary hassles, we’ll get on to the Autostrada [Toll Highway]. We’ll bypass Venezia and with the sun in the face, we’ll bypass Padova, ending our touring day in Abano Terme, a renowned city at the foot hill of the Colli Euganei. A place where people have come, since ancient times, to benefit from the special natural Spa and healthy body treatments. After neatly parking the bikes, we’ll do our usual Hotel check in, relax, and enjoy a well-deserved dinner. but, surprise, surprise,….. Our road Captain knows it best and we will leave it to him to decide on which way to go in order to reach back the city of Firenze. Choices are a few and indeed, a decision about which way to go will be made on the spot depending on timing, weather conditions and, most importantly ‘the spirit’ of our guests riders. Lunch before starting our last tour stage….. towards Firenze /////The day is coming to an end and Firenze has been reached. After the bikes drop-off procedures we’ll transfer-drive to the hotel to check in. In the evening everyone is off-duty Please, take advantage of your leisure time /. It was great for us to have you here and to show you around….. Please, do come back again and bring along your friends next time Thank you…..
VEDETT® ///// MOTOTOURS Team wishes to thank you!